At this rate, folks, Trump’s next executive order might have ICE agents play “Closing Time” from tank stereos situated along the border. Trump participated in a briefing on immigration in Calexico, a small city situated along the border between the U.S. and Mexico, where he used his bully pulpit to hammer home the creeping threat of illegal immigration. There, during an interview with cash for gold commercial sanctuary Fox News’ “Fox & Friends,” Trump told a correspondent that “country is full,” adding that the nation’s immigration system could no longer absorb “a mass influx of illegal immigrants,’ according to network. “No, we’re witnessing people that are going to be brought out of the country,” Trump said to cartoon motorcycle gang leader Griff Jenkins, who asked the President whether the second generation of DACA residents could be forming among new arrivals. “[T]he country is full,” he finished. “There is indeed an emergency on our southern border,” Trump lamented to a pool of reporters gathered there, citing the recent uptick in crossings. “We have our system full. We can’t do it anymore,” said Trump, whose New Jersey golf course had room for illegal employees up until recently. 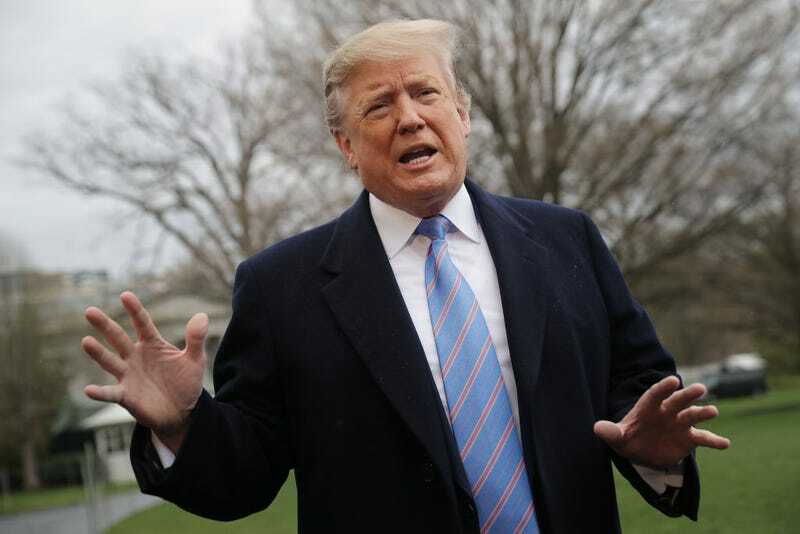 As the Associated Press notes, Trump’s nonsense came Friday, the same day Congress filed a lawsuit to prevent him from spending more money than previously approved to build a wall along the border. Congress’ $1.4 billion, a far cry from his desired $6.7 billion, will have to do. Adding injury to injury, 20 states suing Trump over his emergency declaration requested a court order to stop money from being diverted to Trump’s racquetball shrine. “It’s a scam, it’s a hoax,” Trump said, referring to the efforts of asylum seekers. “I know about hoaxes. I just went through a hoax,” he said, referring to Mueller’s investigation. Fifty-four percent of white people voted for this man.